After the revolution American samplers develop a style of their own . Indeed, even in the nineteenth century, Colonial life was no bed of roses. 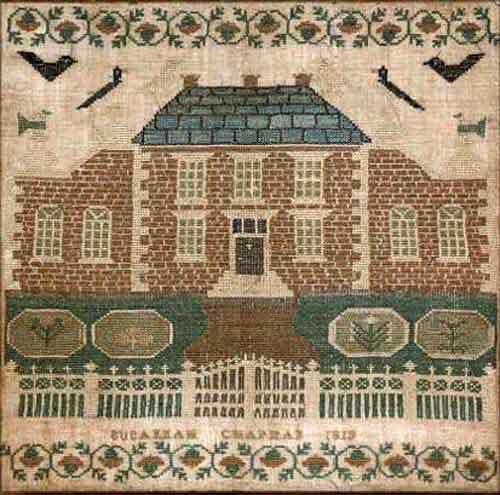 The old Pryor Mill, in Bergen County, New Jersey, the birth­place of the little sampler maker, Sarah Van Home, 1827, was run by tidewater, and we are told that her father often had to arise in the middle of the night to grind the grain. 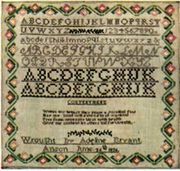 It was just the reverse with the American sampler of the same period. Those whose interest is centered entirely on the fine stitchery done on delicate fabrics will find comparatively little to admire, for although fine work does exist, it is, however, not a general characteristic. Such critics should learn to view these youthful efforts from a completely different standpoint, appreciating the handicaps under which they were made, watching the development of the design which reflected the life of that day, and thus getting at the spirit and true character of the American work; or else they would do well to confine themselves to the study of the better regulated sampler of the English schools. It is important to realize the conditions and influences that made the English and American samplers of the nineteenth century so unlike. For one thing, pattern books were exceedingly scarce on this side of the Atlantic, and although the practice of mak­ing samplers in schools grew with the years, many children lived in remote villages far away from such advantages, and were forced to draw on their own surroundings for inspiration. Aid in composing the design must have been frequently sought from older friends or members of the family, and as they were not past masters in the art of drawing, it led to many amusing inaccuracies in perspective and proportion. For instance, notice Rebecca Slim's gigantic mouse, 1830. He would have had great difficulty in squeezing through the door of her little house. Another difficulty lay in the materials available, which did not lend themselves especially well to very fine work, much of the linen being of a coarse, loose weave, with threads that were apt to pull together awkwardly when cross-stitch was used. Occasionally a child was lucky enough to procure fine muslin or tiffany for a groundwork; the latter lends a peculiar lightness and richness to the background, the colors stand out well upon it, but unfortunately it cracks and disintegrates easily. The silk, much of it home-dyed, must have been originally in a very thick twist, which had to be unraveled before being used, for this is the only way we can account for the crinkly floss we see so often in the embroidery of the flowers, lawns, animals, and figures, as well as in the backgrounds, and which lends itself particu­larly well to the petals of the flowers worked in satin or split-stitch. But when it comes to embroidering a church, where the stitches extend the entire distance from the steeple to the ground without a break, the result is fragile, and such a piece of work should be preserved under glass. Silk of this variety is practically never seen in foreign embroideries. It is different from the floss used occasionally on the English samplers, and is quite peculiar to our country. The kink is very close and not a general wave, and was probably considered pleasing in its effect. If it was a product of China and Japan, and brought home by the old American sea captains, it is strange that the English captains did not do likewise. Why were they less thoughtful of their families' needs? 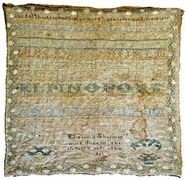 Usually the designs were drawn directly on the linen with pen or pencil, but sometimes the back of a sampler shows, by the bits of paper still sticking to it, that the outline was drawn on thin paper and placed under the linen, the design showing through, and the paper being torn away after the embroidery was finished. 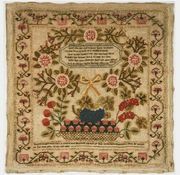 The sampler of Julia Ann Hoffner, where a vivid green bird is to be seen enjoying a meal of scarlet berries growing on an oak, was worked in this way. From time immemorial, stitchery has been found a difficult medium for the portrayal of the human face. Undoubtedly even the mature embroiderers of the seventeenth century gave sighs of relief as they traced the last eyebrow or curved the final smile on the placid face of the king or queen in their needlework pictures. How much more difficult the problem for the American sampler maker, usually a little girl under twelve years of age! When the canvas was small and the figures so tiny that a black cross-stitch could stand for each eye and a long stitch for the mouth, they could cope with the difficulty; but in the larger and more ambitious scenes, where ladies reclined under a tree or stood in front of a sylvan altar, it was a different matter. It was felt that these pictured people should wear the bland, almost simpering expression considered "comme il faut" for females of the period, and so the custom arose of helping out the embroidered design by painting the face and hands. 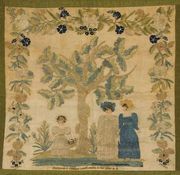 Wilamina Rine, 1813, and Mary Hamilton, 1812 , used watercolor, which possibly gave a satisfactory effect at the time, but their tints have become somewhat faint with the lapse of years; perhaps the tiffany or fine muslin of their samplers would not allow of any other method. Clarissa and Sophia Emerson , who may have been sisters or relatives, since their work is similar in style and date, used oil paint on the heavy linen, but the effect is a little hard. 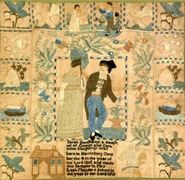 Laura Bowker , 1817, showed a good deal of ingenuity in painting a face for her shepherdess, for she cut it out of paper and pasted it on the linen, and she did the same with some lambs made of kid, and added richness to her cedar trees by embroidering them in chenille. Ann E. Kelly 1825, gives an ethereal look to her damsel, devoutly offering a sacrifice on an altar, by insert­ing the painted face under the thin muslin. The effect is very good; in fact, this is the most successful of all these experiments. In other cases the distant view is helped out by paint, as in the Loring family record, or in the reflection in the water which we see in Lucy Stickney's sampler 1830, showing the house and trees on Charles-town Neck, near Boston. A most realistic effect was sometimes given by applying small squares of mica to represent glass in the windows of houses, the frames being indicated by criss-cross threads, but this idea was borrowed from our English cousins. So we find that our ancestresses evolved ideas of their own for surmounting difficulties, though the paint and other extra touches may not have been applied by the same hands that worked the samplers. In some sections of the country, quaint old ribbons were used as borders, making a neat and pretty edge. Sometimes two ribbons of different widths and contrasting colors were elaborately quilled, one on top of the other, with rosettes at the corners. Again, loops of the embroidery silk were sewed on in clusters, making tufts or rosettes as a further embellishment. Elizabeth Funk, 1813, uses a narrow lute-string ribbon, gathered and shaded darker at the bottom, giving a pretty effect. 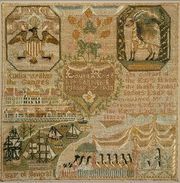 The custom of using quilled ribbon as an edging was much in vogue among the German sampler makers, and the name of Funk suggests Pennsylvania Dutch parentage, although the sampler js thoroughly—rather peculiarly—American in design. Elizabeth evidently wished to make the date symmetrical, so, regardless of accuracy, she embroidered the 3 backward in order to make it balance with the 8. Some of the floral wreaths encircling the verses and names of the less elaborate samplers are very pretty and graceful, as in Sophia Catherine Bier's work , 1810, and one does not regret the absence of the more ambitious scenes. 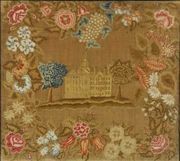 In this same category is one made by Sophia Lamborn , whose design is very similar to those used in the lamp-wick embroidery or tufted bedspreads of that day; perhaps she may have appropriated the pattern from her mother's bed linen. 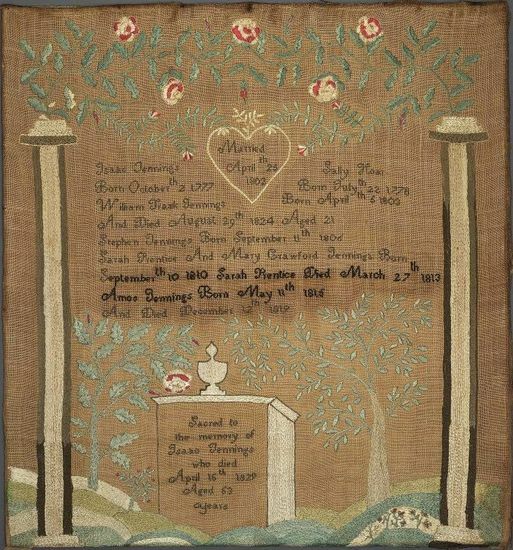 There is no doubt that the practice of making samplers ran in families. In one case, five successive generations embroidered them, the first dating back to 1750, and the fifth a production of the last decade. Most of the examples of the nineteenth century were made by rather young children, the average age being eleven, though some poor tots mark theirs as having been made at a much earlier age, even as young as six or seven. On the other hand, many girls put off the task until they were almost grown. 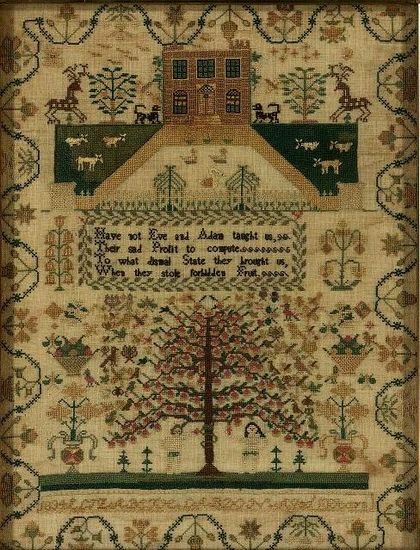 But, on the whole, we think of them as a product of youth, and it comes as a distinct surprise to find Hannah Crafts, at the ripe age of sixty, embroidering a rather elab­orate sampler, with a picture of her own home at the bottom labeled, " Sweet Home, the dearest spot on earth to me." 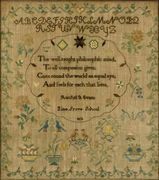 Her heart probably reverted to the days of her youth, when samplers were even more prevalent, and she doubtless reproduced those she remembered, instead of copying the work of the young people about her. She started to cover the canvas like tapestry, but failing eyesight or some other ill prevented its completion, for this was years ago, before the era of giddy grandmothers, when a woman of sixty was considered old and was often crippled with rheumatism. The girls' names appearing on the samplers are a study in them­selves, and very different from those now in vogue. Submit Weyman, Remember Emmerton, Electe Phillips are reminiscent of Puritan days. Achsa Clark, Asenath Holman, Keturah Moore, Tamson Mulford are Bible names. Philadelphia Webb suggests a connection with the Quaker city; Lovey and Nabby (the latter occurring rather frequently) are probably nicknames; Britannia Holbrook proclaims her English parentage. But where did Amersha Arnold, Lucinthia Cone, Emirancy Howe, Roxa Tainter, Anzolette Hassan, Oceana Harris, Freelove Turner, Waite Phetteplace, and, most sonorous of all, Amorena D. T. Roberts, acquire their names? One wonders if in large families the stock of names became exhausted and the parents were obliged to draw on their imaginations. In the Field family register, the mother's maiden name was Miss Piana Petty. 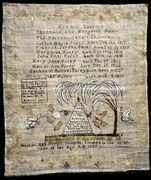 On a sampler dated 1827, we find the following statement: " Brooksania Waters is my name Milford is my station Milford is my place abode And Christ is my Salvation." Another delightful name is Parley Bates, who in 1811 made a record, with one of the pretty, bright red berry-like borders that were popular in the vicinity of Providence; the berries done in a sort of coarse and effective cat-stitch. Parley's twin brother's name was Nahum, and we come across other men's names that are strange to our ears, such as Mickel Trufry and Friend Collens. A great many fanciful ways are used for inscribing samplers, the American child not being constant to the expression "Wrought by," so in vogue in Great Britain. 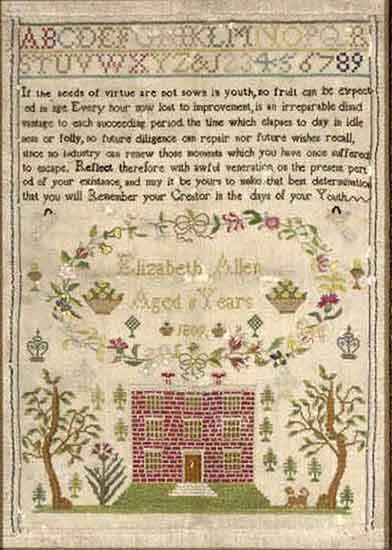 Sarah Baker, 1811, uses the expression "marked her sampler"; Anna Brown says, "This I did in the year 1824"; Ruth Davis's sampler, 1817, was "performed in her eleventh year"—she was evidently a motherless child, as her verse runs: "This work I did to let you see What care my Papy took of me." 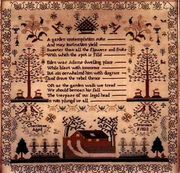 An American silk and linen needlework sampler by Louise Lothrop, Massachusetts. 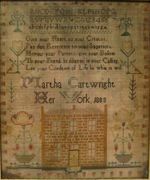 Silk & Needle Work Sampler.